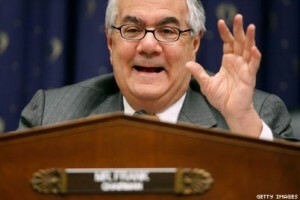 Barney Frank’s stance on the online gaming issue has made the Massachusetts Congressman a darling of the poker world, but it’s quite unlikely that very many poker players realize why the Congressman opposes a ban on online gambling. Frank doesn’t gamble himself –at all—but has a very good reason for championing this cause: “The government shouldn’t tell people what to do with their own money.” Amazingly, you would assume this line of thought would come from the conservative side of the aisle –which as a core principle are against big government involving itself in people’s lives—but Frank, and most of the other supporters in Congress, are from the Democratic Party! At the same time, the opponents of legalizing and regulating the online poker industry come from the Republican side! With regards to this issue up is down, and black is white. Basically, what has happened is that online gaming has become a social issue, which has flipped its proponents and opponents on its head. With the conservative right pouring money into republicans who are socially conservative it’s unlikely the end-game will be settled for years to come. This entry was posted on Wednesday, December 16th, 2009 at 9:38 am and is filed under Poker News. You can follow any responses to this entry through the RSS 2.0 feed. You can leave a response, or trackback from your own site.